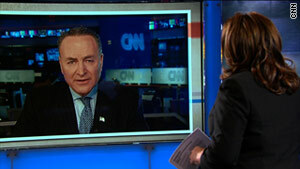 Sen. Charles Schumer called Sunday for a short-term extension of the current spending resolution. Washington (CNN) -- Leading Republicans and Democrats on Sunday signaled a desire for compromise on a short-term spending resolution to keep the government running while more substantive talks on budget cuts take place. On morning talk shows, members of both parties insisted that no one wants the government to shut down on March 4, when the current resolution authorizing government funding at last year's level runs out. The Republican-led House on Saturday passed a spending resolution for the rest of fiscal year 2011, which ends September 30, that would cut $61 billion from current spending levels. Senate Democrats, who hold a slim majority in their chamber, say those cuts have no chance of passing. They want to negotiate more targeted reductions that allow for new investment in education, energy research and other areas championed by President Barack Obama. With Congress in recess until February 28, concerns have risen of a possible government shutdown if no deal is reached by March 4. Some of the leading players said Sunday that won't happen. "My guess is we'll probably have some short-term extensions while we negotiate these things with spending cuts," Republican Rep. Paul Ryan of Wisconsin -- the new chairman of the House Budget Committee and the architect of the spending cuts the chamber passed Saturday -- told the CBS program "Face the Nation." Such a short-term extension, perhaps only a few days or weeks, would allow for tough talks on cuts in spending for the rest of this fiscal year that could set the tone for next year's budget and beyond, Democrats say. "We may need to extend slightly to give us a few more days to work it out," Sen. Claire McCaskill, D-Missouri, said on "Fox News Sunday." She called for a strategic spending plan to spur economic growth while instilling fiscal discipline, rather than the House GOP spending plan that she characterized as taking "a weed-whacker to the discretionary domestic budget while letting the Pentagon off scot-free." Another Democrat, Rep. Chris Van Hollen of Maryland, hinted that despite tough talk by his party on combating the Republican strategy, a compromise was closer than some people realized. In his final comment on the CBS program, he said of Ryan: "Paul and I agree on more than you might think on some of these issues." New House Speaker John Boehner, R-Ohio, took an unyielding stance last week, saying any extension of the spending resolution for this year would have to include budget cuts. Boehner and other Republicans -- particularly fiscal conservatives energized by support from the Tea Party movement that helped bring the GOP to power in the House in November's election -- say the nation's budget deficit and rising debt require immediate action. They also want to shrink the overall size of government and consider the current political climate a good opportunity to wring concessions from the White House and congressional Democrats. Democratic Sen. Charles Schumer of New York took umbrage Sunday at the Republican strategy, telling CNN's "State of the Union" that a short-term extension of the continuing resolution should be at roughly the same level as current spending. Specifically, Schumer called for Democratic-proposed cuts of about $41 billion from Obama's 2011 budget proposal, which was never enacted. With those cuts, spending under the Obama plan would remain very close to the current level, which is a continuation of fiscal year 2010 spending. By contrast, the House spending resolution passed Saturday cuts $100 billion from Obama's proposed -- but never enacted -- 2011 budget, or just over $60 billion from current spending for the rest of the fiscal year. Ryan called that level of spending unacceptable, in the short or long term. "We don't want to accept these extremely high elevated levels and so we're going to have to start negotiating on these things, not just with the Senate but also with the president as well," he told the CBS program, later adding: "If we wait for the other party to go first to propose reforms, then nothing will ever get done. ... Where the president has fallen, we're going to lead." McCaskill, however, accused Republicans of threatening to stonewall the process instead of seeking real negotiation. "We all want cuts," she said on Fox, adding about Boehner: "He's the one who is saying he won't even do a week or two days or four days. It's silly." To Republican Sen. Lindsey Graham of South Carolina, the Democrats are the ones threatening to undermine the negotiating process. "The only way we'll shut the government down is if our government colleagues insist on keeping the federal government large and unsustainable," Graham said on the NBC program "Meet the Press." He added: "There will probably be a temporary CR (continuing resolution), but it will have some spending cuts."